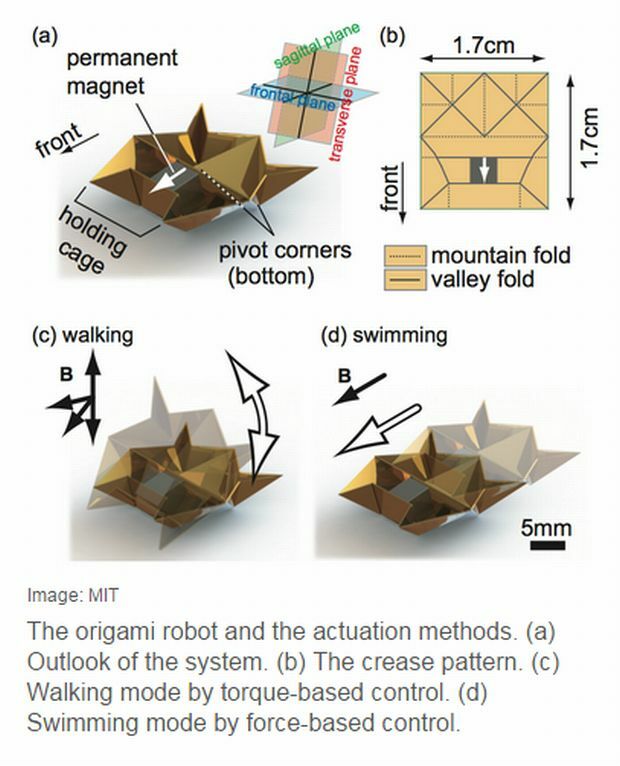 Researchers from CS & AI at MIT in collaboration with Technische Universitat, Germany have created a self-folding bot based on Japanese concept of folding paper into decorative shapes and figures called origami. 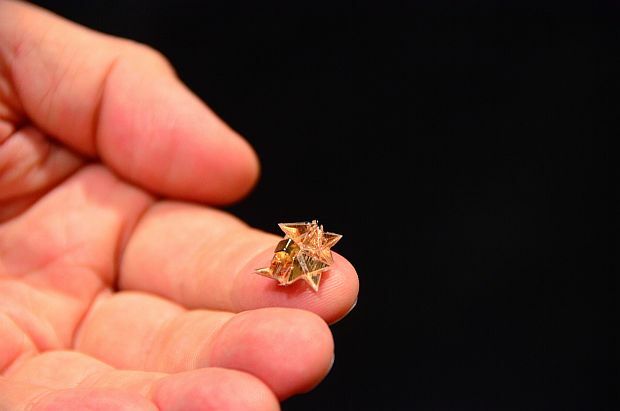 The tiny bot fold, walks, swim and degrades autonomously. Very deftly the robot is able to float on water due to its boat shaped architecture, it can walk on trajectory, climb slope, human skin, can deliver a block, carry a load, dig through a stock and one of the most amazing feature is it can self disintegrates by dissolving into acetone. The tiny device is embedded with a magnet and synthetic plastic polymer, PVC packed in between laser-cut structural layers (polystyrene or paper). Upon heating, the PVC shrinks and creases from where the basic structural parts have been incised. The self-folding process takes couple of seconds to complete. In the words of Kelsey Atherton, four electromagnetic coils give power to not only the autonomous folding exercise but also helps the bot in giving direction as per its shape. When the device is placed in acetone, it gets completely dissolved leaving behind the embedded magnet. Researchers claimed that their approach of having minimal body materials in their design has allowed the tiny bot to completely dissolve in a liquid environment. Researchers envision creating a similar bot with embedded self-folding sensors for autonomous operation within human body targeting both in vivo and bionic biological treatment.